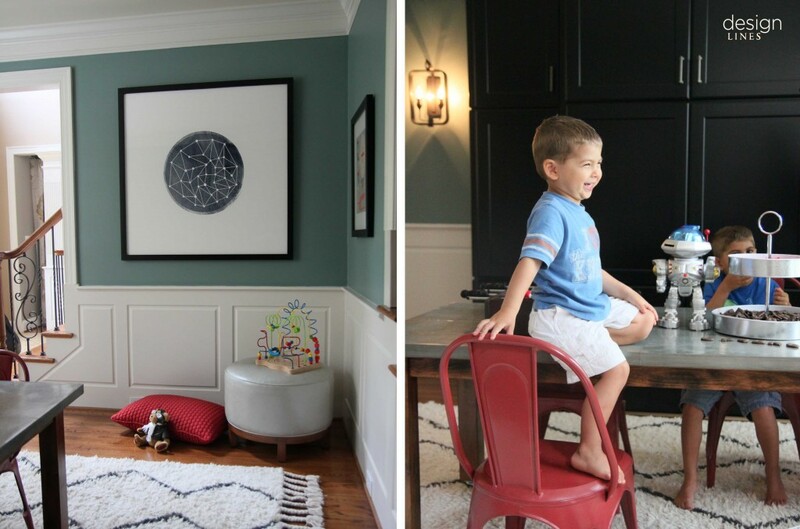 For the Kids | Design Lines, Ltd.
Current Projects: Goodbye Formal Dining Room, Hello Playroom! 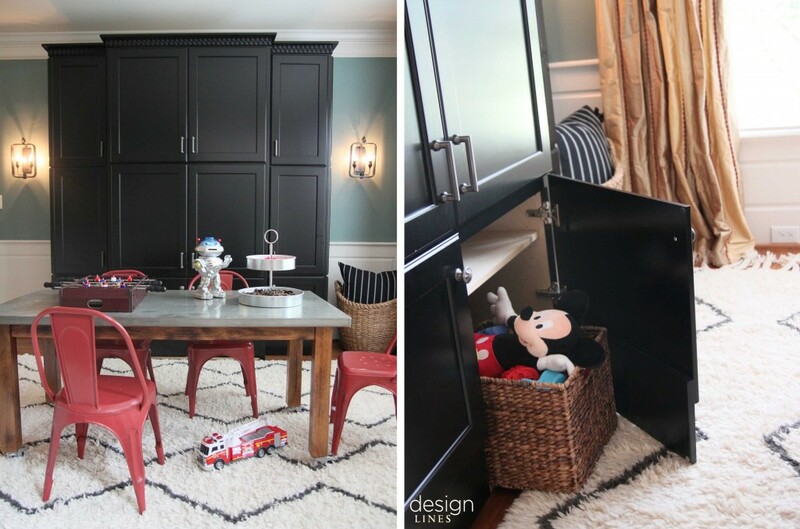 When a favorite client told me that she wanted to convert her formal dining room at the entrance of her house into a playroom space that her three children could enjoy, I had my doubts. Of course, I subscribe to the belief that you should live in every room in your house, but I had my concerns about the potential mess being right near the front door. I should always trust a mother’s intuition. 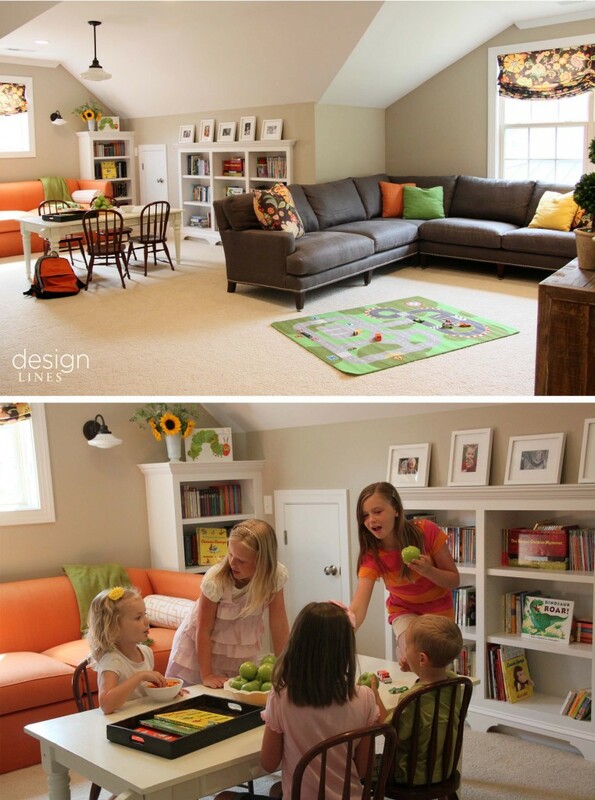 I love the end result of this space we designed and that our client is only a glance away from her kids at play. We kept the draperies and wall sconces but said goodbye to the other formal dining room furnishings. I designed a custom cabinet for plenty of toy storage and a place for the tv to live. 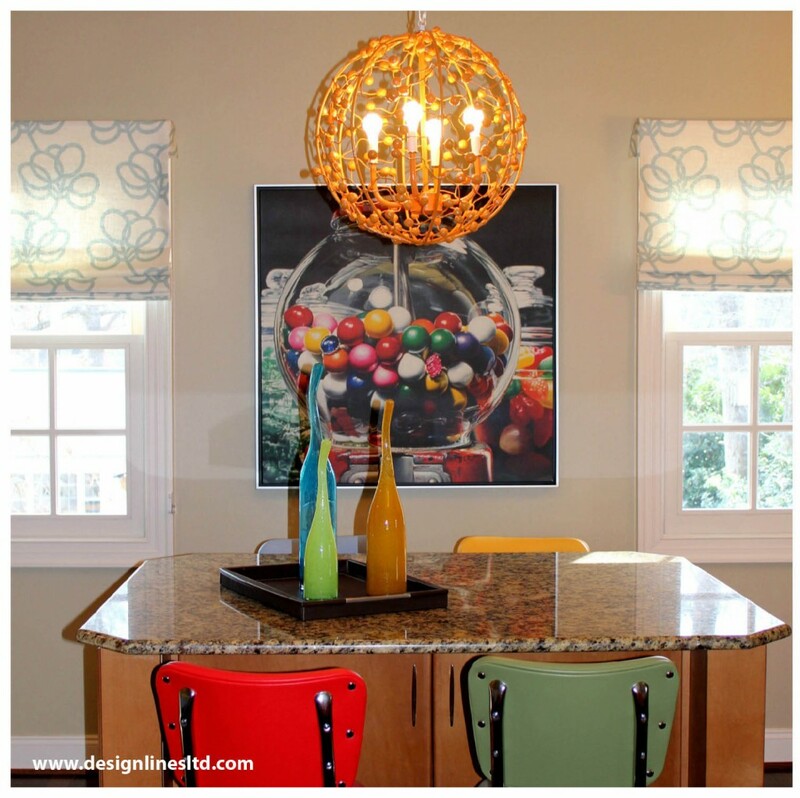 The finish on the cabinet is a sophicated black and the wall color changed from a deep red to turquoise. 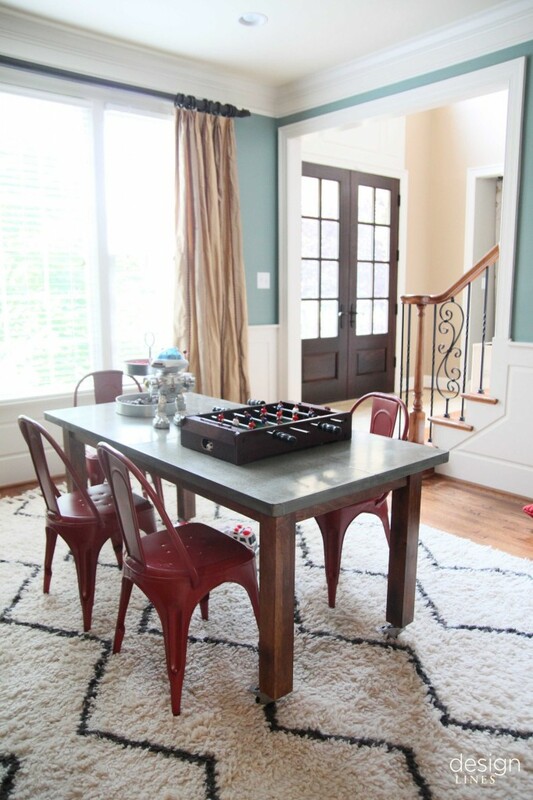 This room provides versatility as the play table from Restoration Hardware can be wheeled out of the room and the room can host a dinner party or bookclub gathering for adults. The Souk Rug from West Elm brings a luxourious texture for little bare feet and imaginative play. When my clients went to Italy on their Honeymoon, they spotted this Murano glass chandielier and had to have it for their future daughter’s nursery. Two sons and 7 years later that dream came true. Color inspiration came from the feminine Vervain printed linen fabric featuring butterflies and flowers which we used to create blackout traversing drapery panels. 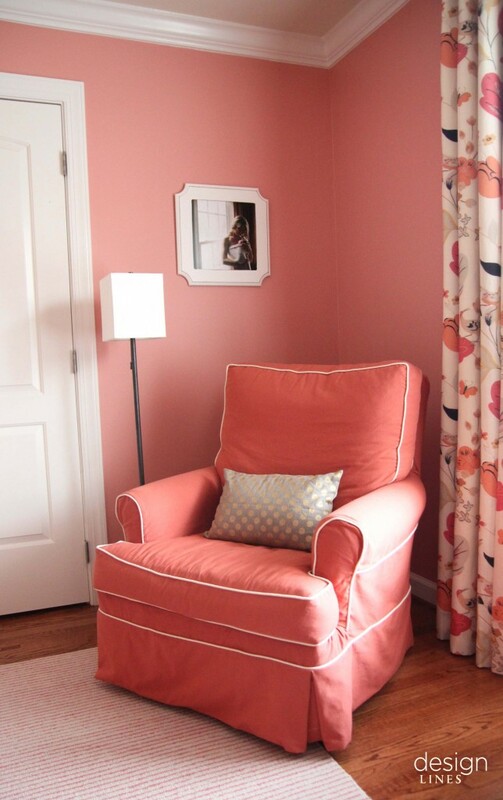 The wall color is a beautiful peach hue – ICI Sun Kiss – rather than a traditional pale pink. 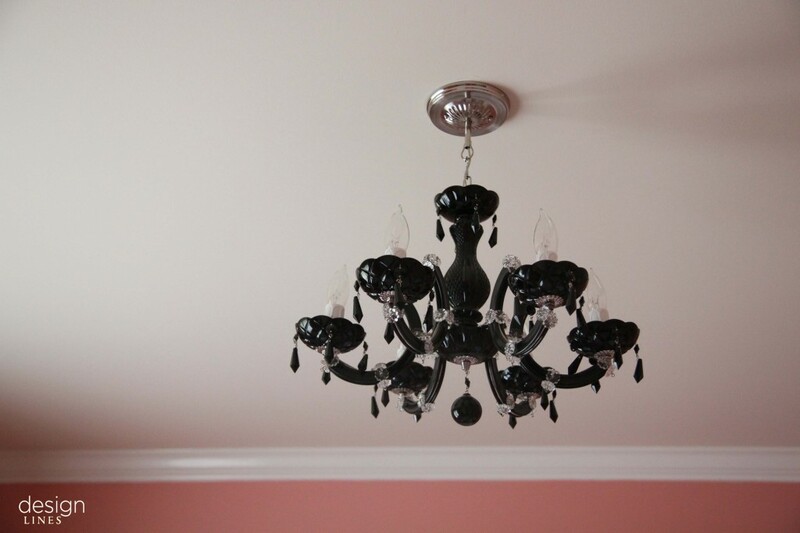 We painted the exisiting crib antique white. The rocker (featured in a previous nursery blog post) got a girlish makeover with a new washable canvas slipcover from Four Seasons Furniture. This room is a perfect mixture of glam (i.e. the black accents) and sweetness. My favorite element is the Euro Sham to dress the crib from Caitlin Wilson Textiles. Enjoy a few captures of the space. 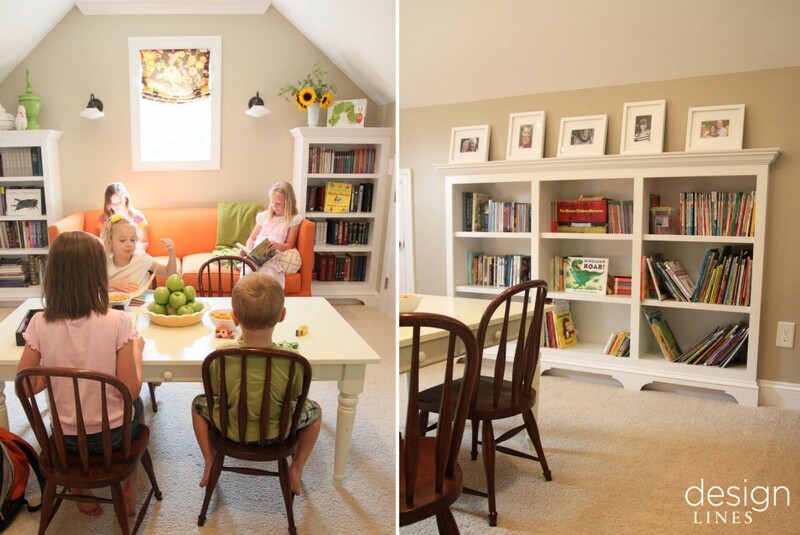 My clients in Durham had the idea of turning their big blah bonus room (you know the kind) into a library and playroom for their seven children. 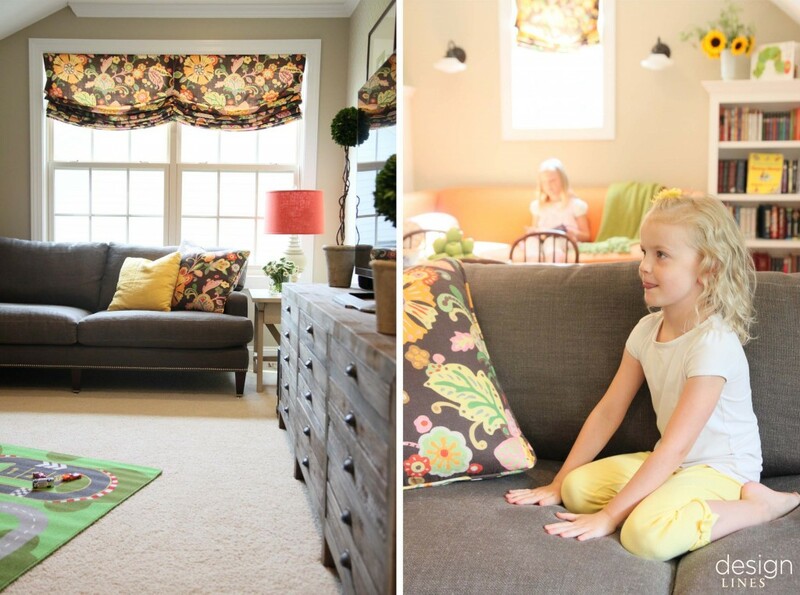 They wanted the space to function for all – with the kids ranging in ages from 3 – 14 years; and serve many purposes: a library, a classroom, an arts and crafts center, a movie-watching room, for dance parties on the wii, sleepovers, and creative play. 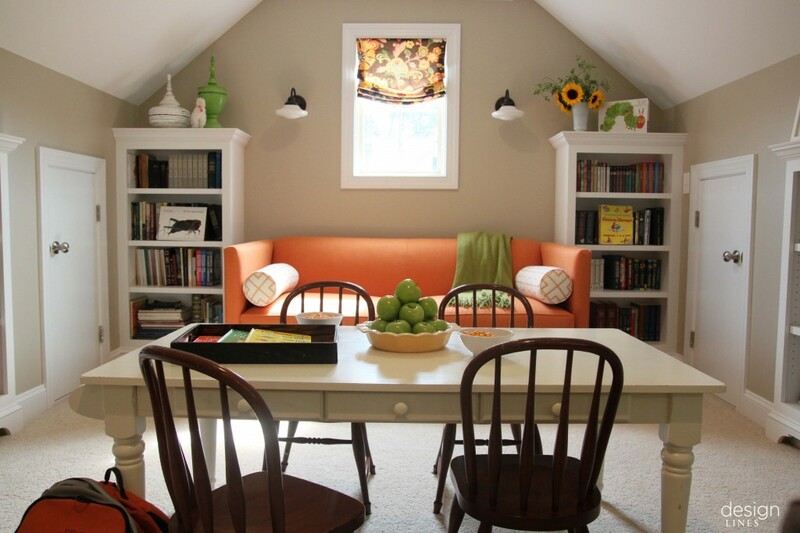 We first devoted time to making the room just the way we wanted- utilizing attic access space for built-in bookshelves, adding much needed lighting, painting the walls (they went from an off- white to a warm taupe color) and installing wallpaper to one long wall to add interest. The color palette was inspired by a whimsical and colorful linen print from Clarence House in hues of orange, pink, yellow, and green. 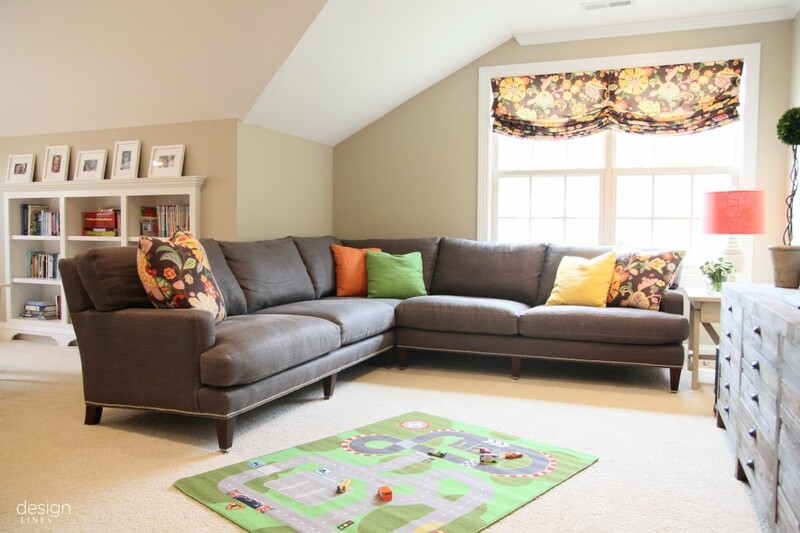 The selection of the furniture pieces themselves- an orange loveseat (my personal favorite part of the space) a sectional sofa, entertainment unit, play table and chairs (existing), came naturally as they were both fun and functional. Last week we joined up with a few of the kids for the photo shoot- it was fun to see them enjoying and using the space. 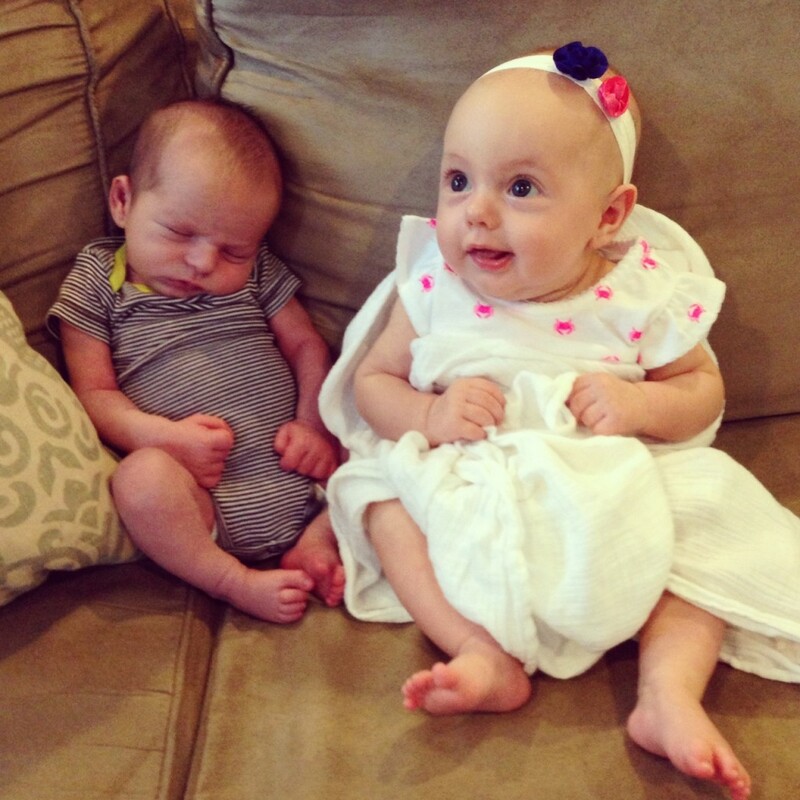 That’s right – our Design Lines family has expanded with the addition of two little ones. Lauren welcomed her first child, Caroline in April and Ashley just recently gave birth to her second child, Joseph in July. Joseph and Caroline meeting each other for the first time! 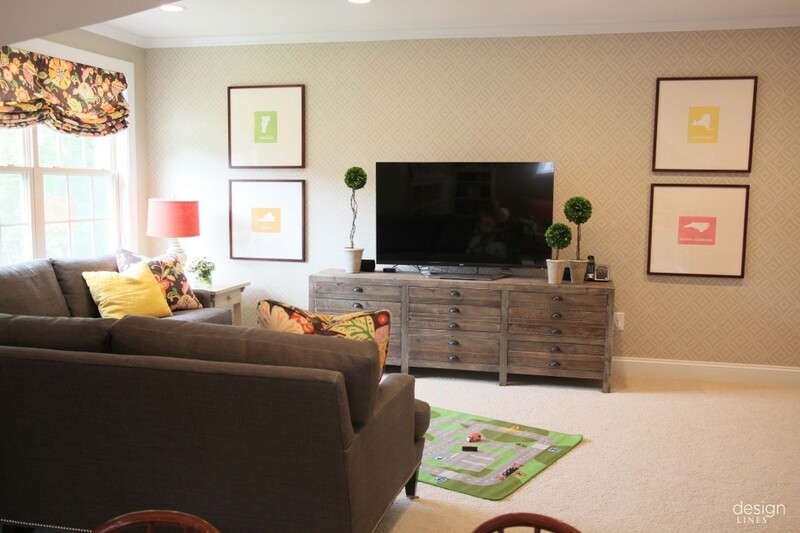 For a growing Raleigh family, this loft above the garage was designed with movie and game nights in mind! 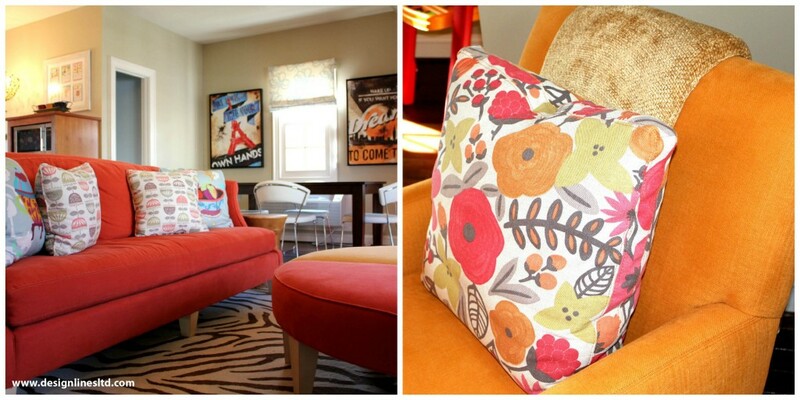 Bright colors fill this happy space. 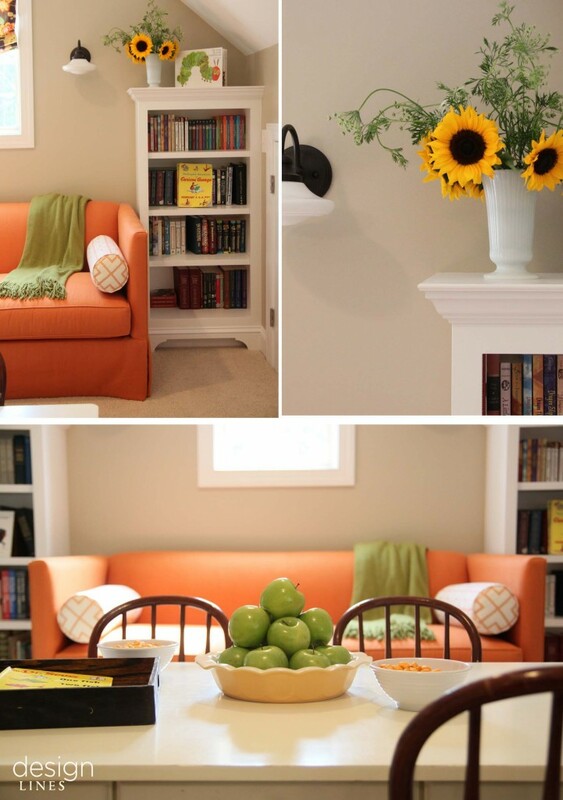 This space also functions well for adults. Reading a book curled up on the couch or breaking out into a sweat to the latest DVD workout. 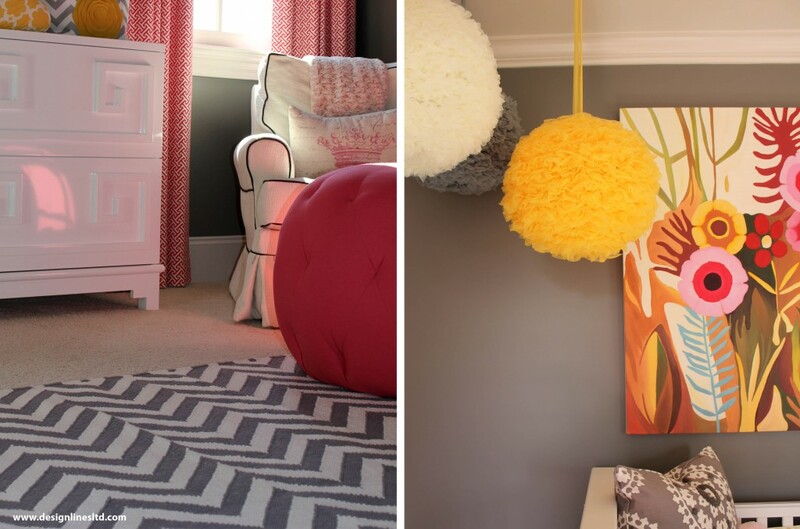 Playful fabrics paired with a zebra rug add elements of fun to the space. We love the functionality of this oversized ottoman that can be seperated into four little triangles for additional seating. We think the coolest feature are the built-in cabinets that house a television which appears with a hydraulic lift. 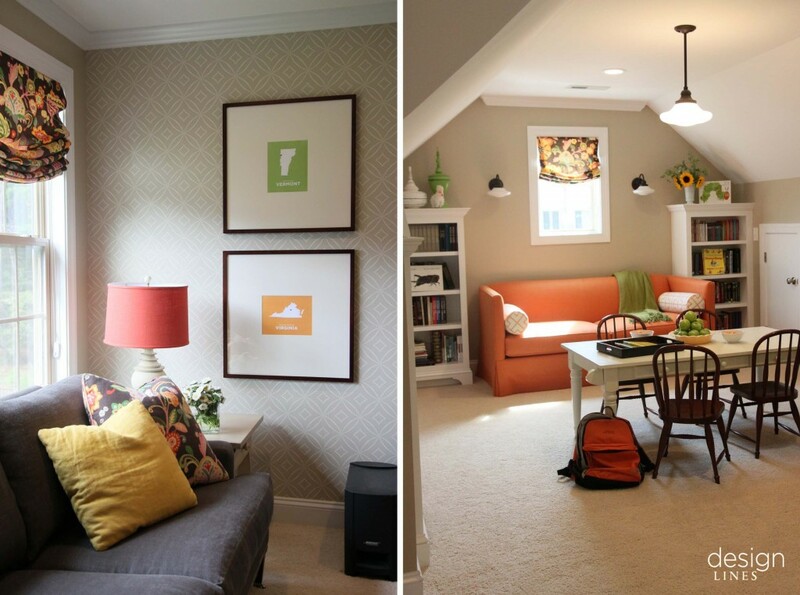 Do you dream of a fun multi-functional space in your home? Tell us about it. 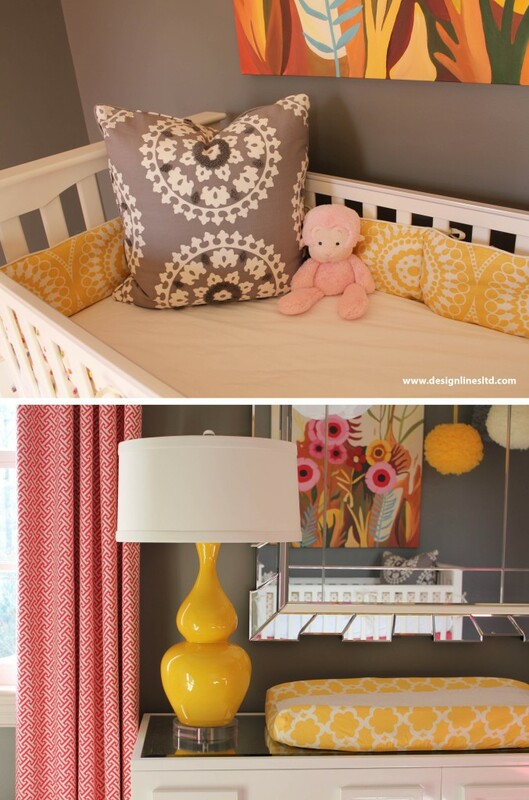 Designing a nursery is always a fun project to tackle and I’m excited at how this little girl’s nursery turned out. Here are a couple completed shots! 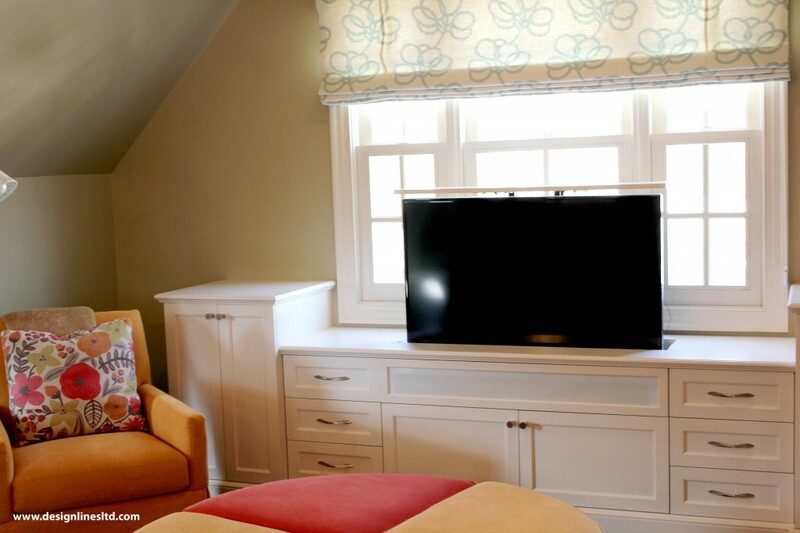 My favorite element within the room has to be the white dresser, which currently serves as the changing table. The design is young, chic, and definitely fun! To learn more about the beginning stages of the project feel free to take a look at previous blog posts. 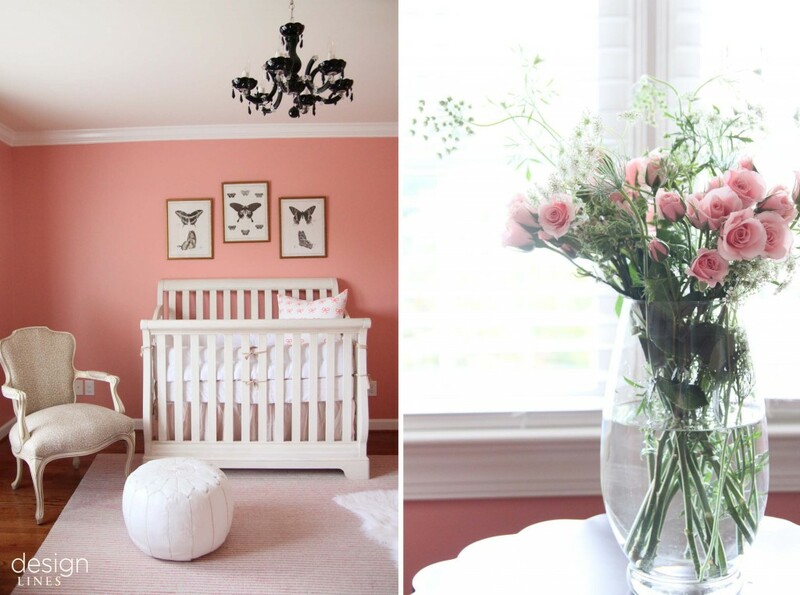 Designing a nursery should be fun and an adventure! I always tell clients once you know the gender, begin gathering ideas on different color concepts or themes for the nursery. If you plan on waiting to find out the gender that is okay too, not to worry. Today’s color trends tend to be more modern and bright; but this doesn’t mean you can’t go for the soft pinks and blues. These days there are a tons of inspiration on blogs, etsy, and Pinterest. 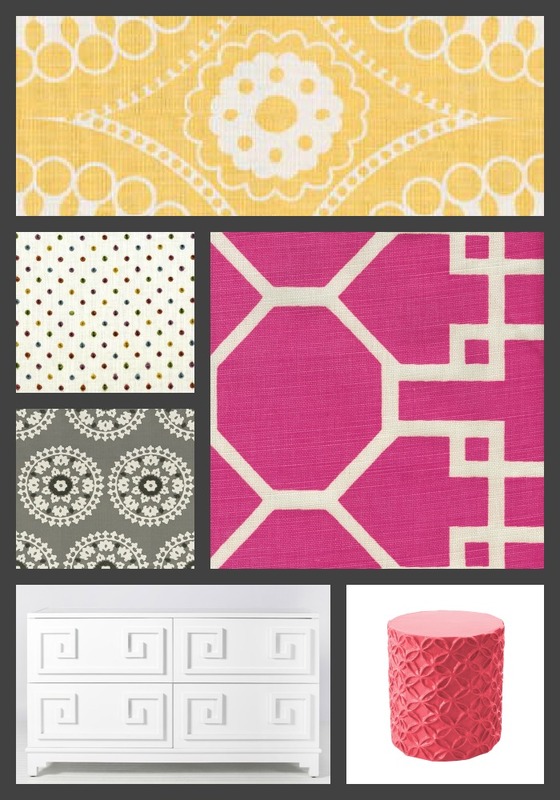 Design Lines has even created a “children’s room” board especially for the mother to be, so take a look. 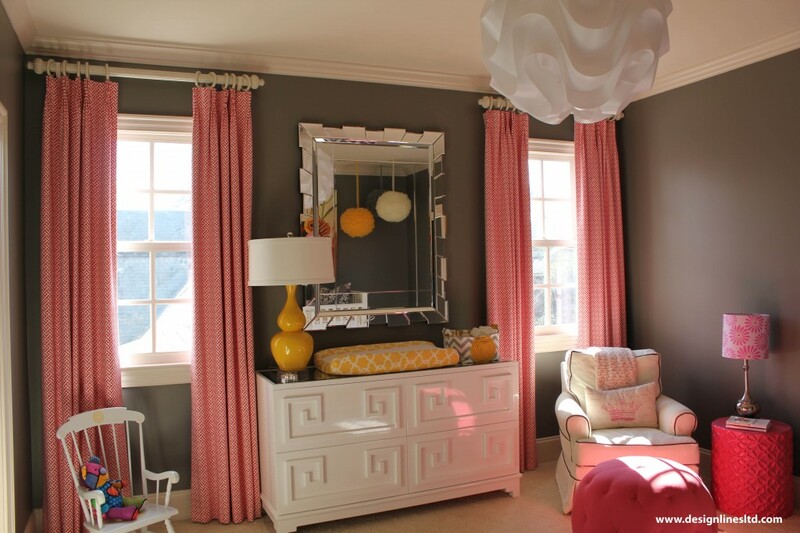 For a current client of mine, I designed the nursery using a bold gray on the walls and then pulling yellows, pinks, and creams in the window treatment, chair and crib bedding fabrics. Once the room is complete I will be sure to share the final look, so stay tuned! Another thought to consider…is you must have a COMFORTABLE chair. As a mother you will spend a lot of time in the nursery so be sure you find a chair you love. I would even splurge on buying a cool ottoman too that compliments the chair, plus who doesn’t want to put there feet up. Those first couple of weeks you need all the rest you can get, so make it comfy for yourself! 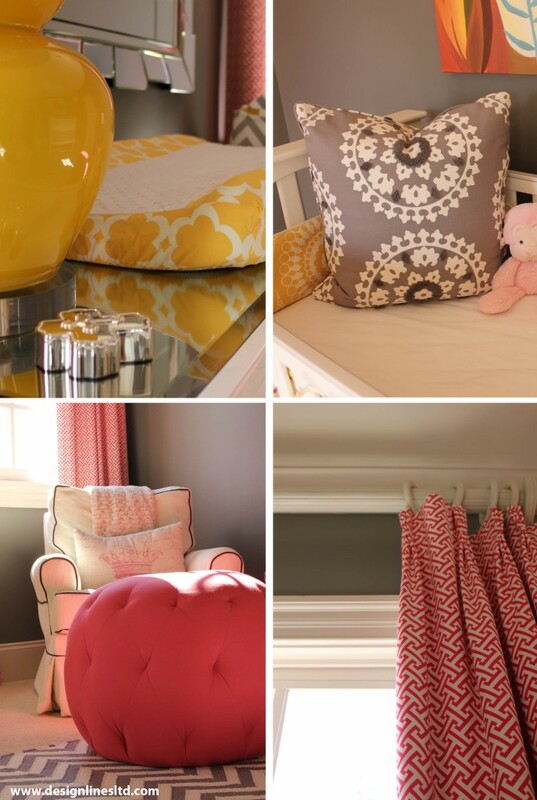 Have you thought about accessorizing the nursery? 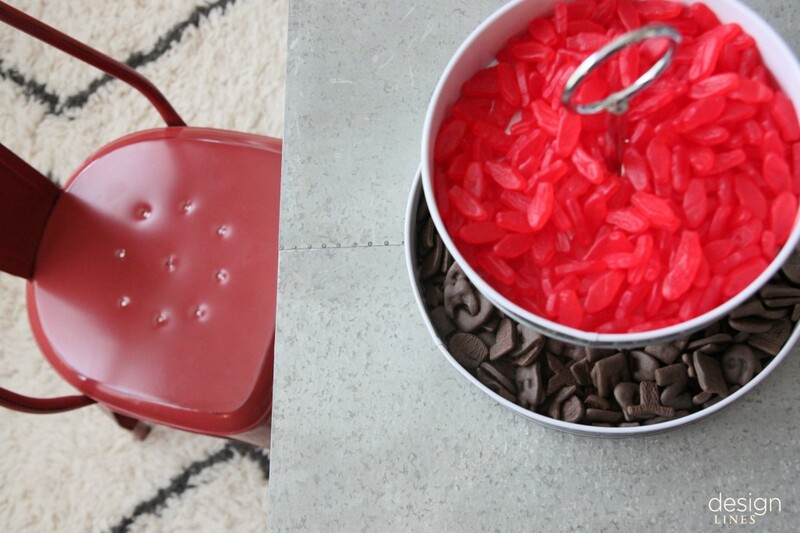 While you want to steer away from the small trinkets that the kids can easily put in there mouths…these accessories offer great solutions depending on your color scheme. Frames hold great family photos. Need some trinkets to hold valuables? 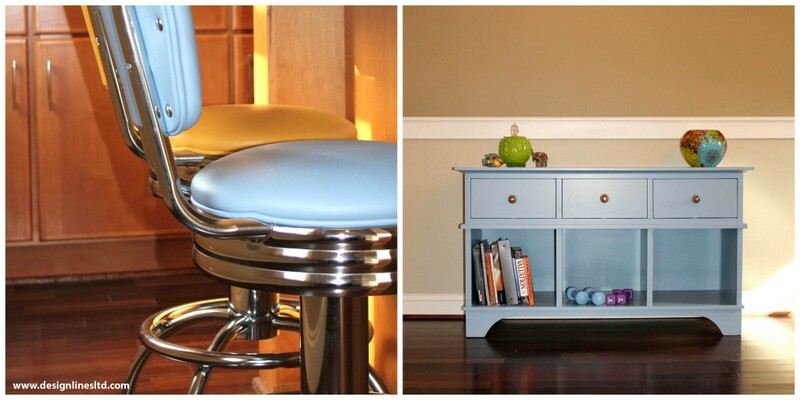 Boxes and trays are always an option or consider a side table next to the chair like this one from Lucy Smith Designs. 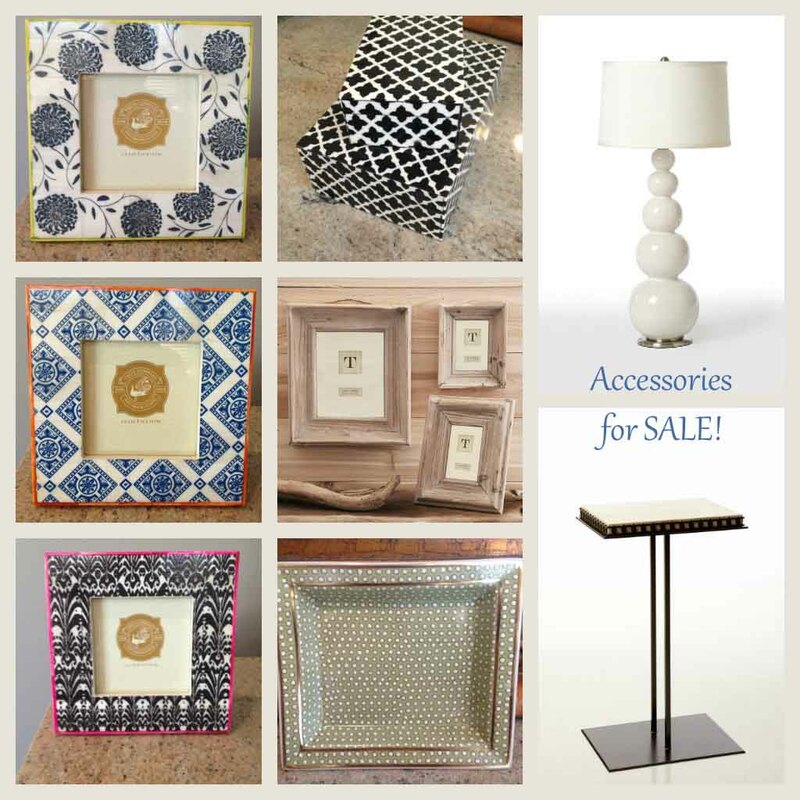 Interested in purchasing any of these accessories? Give us a call! 919-852-0570. 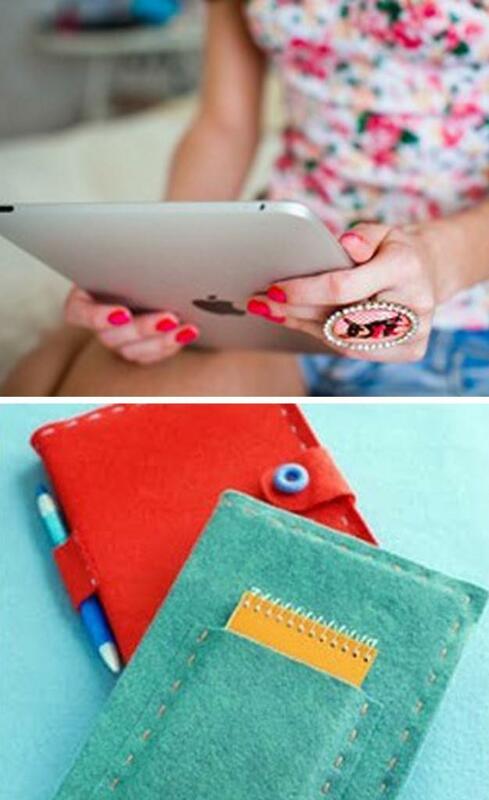 Top 5 Must Haves for Back to School! Bust out those backpacks! It’s back to school time- we’re sad that summer is coming to a close, but look forward to cooler temperatures and crisp autumn air. We’ve made our list of back to school must haves- so sharpen that No. 2 and jot these down. 1. The I-Pad. You know you want one. Judy says of hers, “It’s having all the things you love to do in one place!” She listens to music, peruses the news, checks the weather, and reads on her device. Molly adores the speed and clarity of the I-Pad. 2. 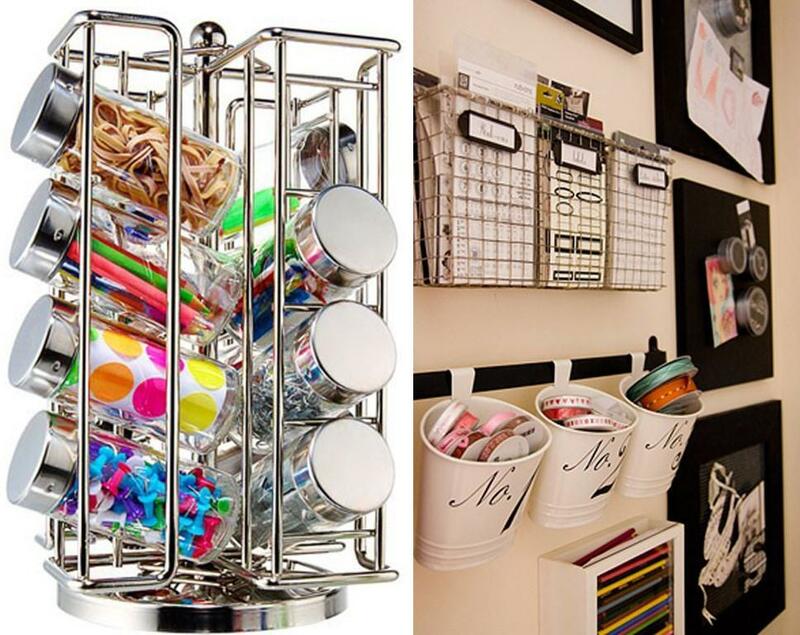 Home Office Organization – Remember how new school supplies inspired your grade school self? 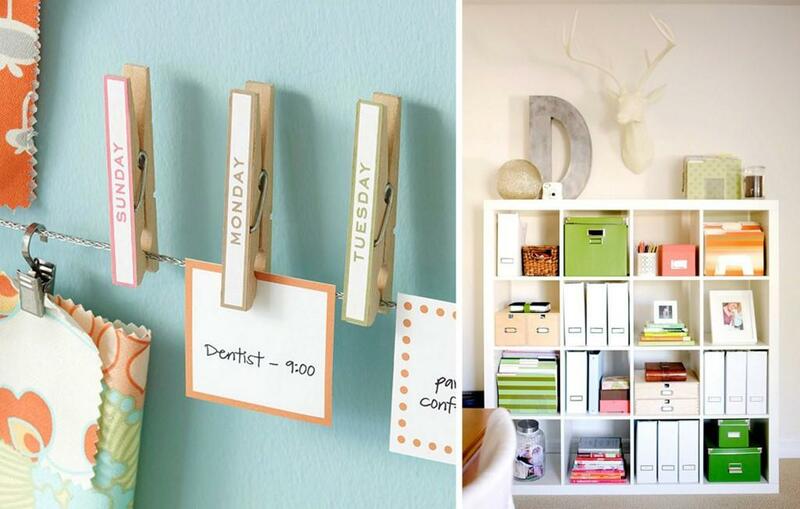 Organization tools can also motivate you. Design Lines loves the Container Store of Raleigh- where you can find boxes, calendars, pin boards, shelving, etc. 3. The perfect after school snack – It’s still hot out in the Triangle. 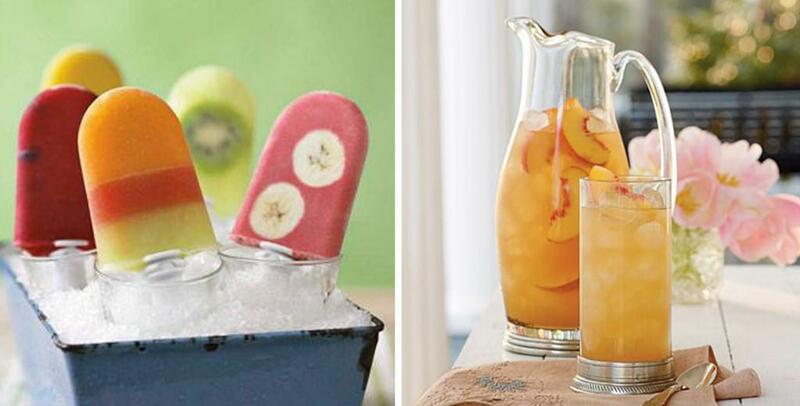 Take a break with popsicles or a cool refreshing glass of peach iced tea. 4. Inspire your space – Find something that is your signature that makes you smile and use it- it could be the stamps you use or something like gold paperclips (Brittany’s favorite)- Use a beautiful glass container rather than a boring pencil cup or a shell from that summer vacation as your paper weight. 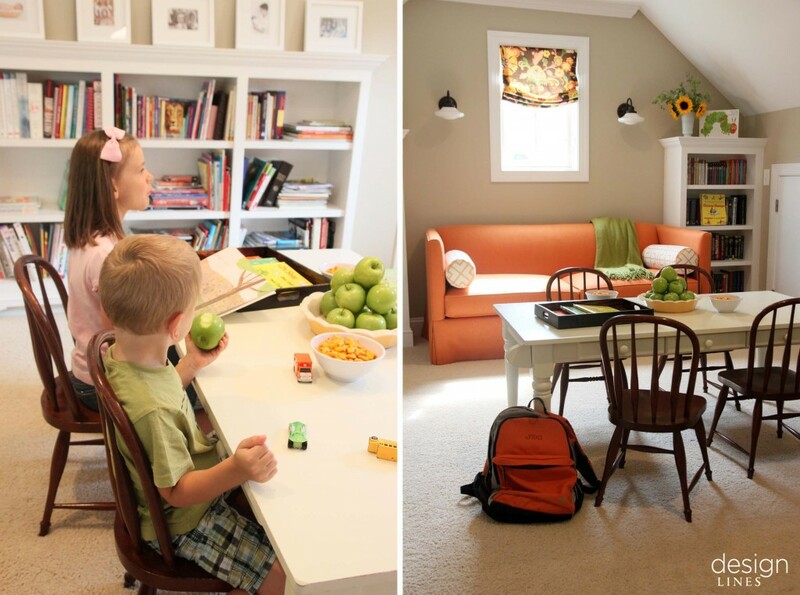 Consider the addition of wallpaper to the homework spot or beautiful new hooks to hang those backpacks from! 5. A back to school outfit – Reenergize now with an addition to your wardrobe- even if your back to school routine only includes a college class, the carpool line, or the PTA. Some trends include colored denim, blazers, & stripes everywhere. Consider the perfect bookish trend: new specs! Be sure to check out last year’s list here. Warmer temperatures and the gift of an extra hour of sunshine from Daylight Savings time has led to all kinds of excuses to plan a picnic or play hostess to a weekend soiree. With that, we’ll share some of our favorite recipes for springtime sipping! 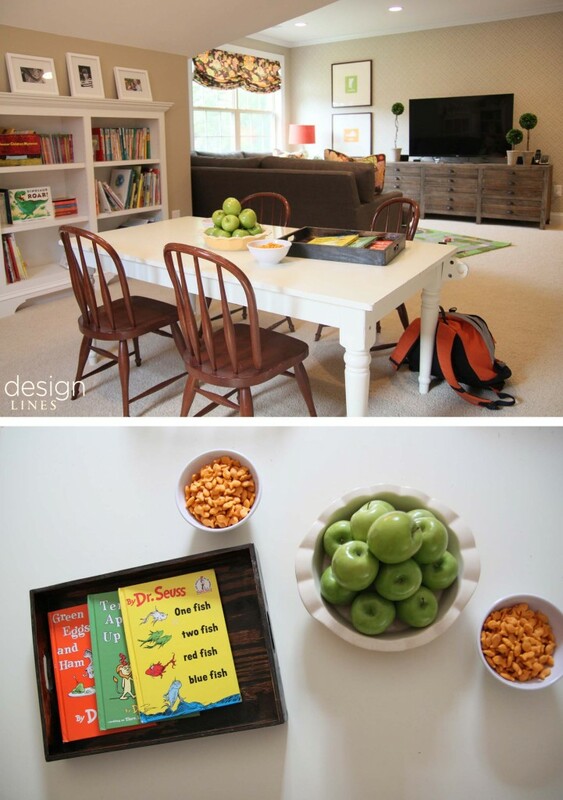 Even round up the kids, as these are easy and fun to make together. Mix together and allow to sit for 45 minutes before serving. 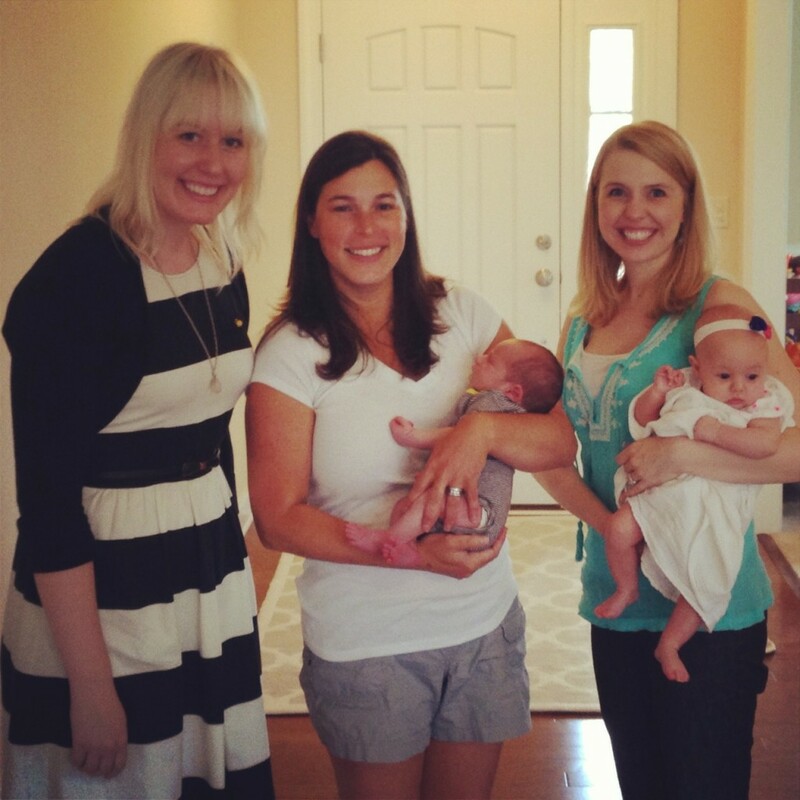 Lauren made this delicious Peach Punch for a baby shower she recently hosted. 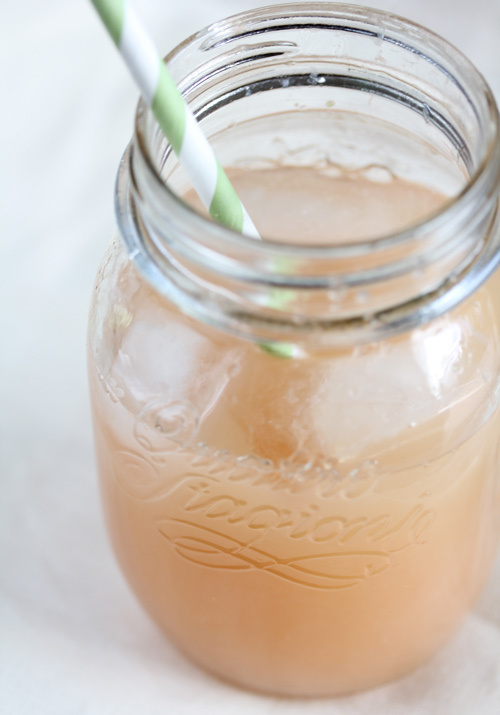 Hilaire found this tart Ginger Grapefruit Lime juice post and we can’t wait to make it! In a small saucepan, on medium heat, mix together sugar, ginger, and water. Simmer for about 5 minutes, then transfer to a glass cup or bowl – place in the fridge or freezer to cool. In a pitcher, combine grapefruit and lime juices. Remove the ginger mixture from the fridge/freezer and strain into the grapefruit juices. If you don’t want pulp, you can strain the grapefruit juices. 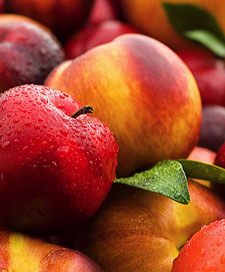 I like the pulp. Stir the ingredients and taste. Feel free to add more sugar or juices. I like it strong and ginergy so this was perfect for me. 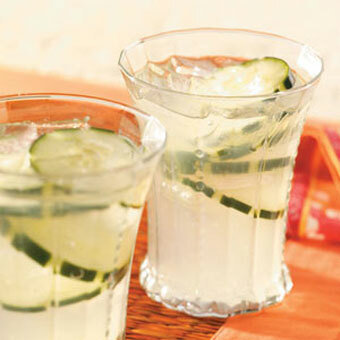 Serve chilled with ice or add sparkling water to give it some bubbles.